Political decisions and political crisis in one country or region in the world can affect local economics and international trade significantly. Such situation of trade creation at one side and trade decrease on the other side has been observed as the consequence of political circumstances between Russia and Ukraine in 2014. National economics and trade of several countries and regions of the world have been suffering from this political crisis. At the same time with trade sanctions and trade decrease among traditional trading partners (EU-Russia, USA-Russia), the effort to ensure a sufficient market supply in Russia and strengthen links among Russia and customs union countries has been observed. A side effect, higher economic and political risk in doing business with Ukraine, caused the trade decrease with Ukraine, too. The chapter analyses selected trade indicators related to international trade of Ukraine and Russia for period 2010-2014 and identifies possible opportunities and threats following from political crisis and affecting international trade of selected trading partners. A specific element influencing current global economy development is trade. 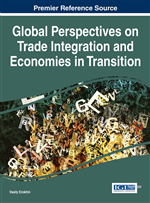 Trade has been playing an important role in the global economy growth and formation (Gálová & Horská, 2013). Global trade – based on comparative advantage idea – enables individual countries to produce and to consume more products than if they would be fully self-sufficient. Global economy based on international trade – both in relation to regional and inter-regional level – provides significant stimuli for economy growth in all regions around the world, claim Maitah and Smutka (2014, p. 37). The most conventional forms of international business transactions are international trade and investment. International trade refers to exchange of products and services across national borders, where trade involves both products (merchandise) and services (intangibles) (Cavusgil, Knight, & Riesenberger, 2008, p. 5).